AlP is a fumigant for stored cereal grains, used to kill insects and rodents. Cases of AlP poisoning is under-reported. AlP is cheap, readily available, highly toxic. AlP is the most common cause of suicidal death in North India. Mortality rates from AlP poisoning vary from 40-80%, usually >50%. 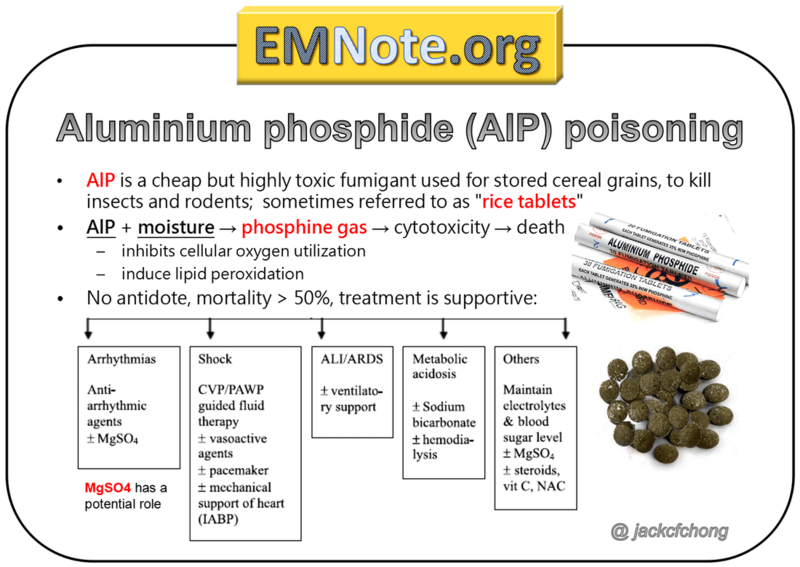 The toxicity of aluminium phosphide is attributed to the liberation of phosphine gas. Phosphine (PH3) is a colorless gas with a disagreeable odor of fish or garlic. It is a cytotoxic compound that causes free radical mediated injury, inhibits vital cellular enzymes and is directly corrosive to tissues. CDC has classified phosphine as immediately dangerous to life at 50 parts per million. The major lethal consequence of aluminium phosphide ingestion is profound circulatory collapse. The dominant clinical feature is severe hypotension refractory to dopamine therapy. Diagnosis depends on the clinical suspicion. Silver nitrate test on gastric aspirate can be positive. In some nations, tablets of AlP are also referred to as "rice tablets". Management of AlP poisoning remains purely supportive because no specific antidote exists. Gut decontamination within 1-2 hrs can be effective. Potassium permanganate (1:10,000) gastric lavage can decompose the toxin. Magnesium sulfate may decrease the likelihood of a fatal outcome.